A liquid page will resize to fit whatever size browser window (within reason) that the user has available. … the real goal in building a website is to provide the user with a seamless interface to information. The site should not intrude on the user’s thought processes, but should gently guide them to their desired destination. If a site doesn’t look right because it doesn’t fit the user’s browser window, then the design has become intrusive to the user. — Glenn Davis, quoted in 15 Minutes, sometime in 1997. Liquid design was part of a “works for everyone” approach to web design, but it had limitations. For one thing, breakpoints hadn’t been invented. CSS layout was in its infancy, used by almost no one, except in experimental work. The ability to separate content and behavior from presentation was nonexistent, unless you limited “presentation” to setting type in a single column, letting the user override the type setting, and letting the column reshape itself to fit any viewport. With so few controls available, Liquid design tended to become unusable in certain settings, and was almost always ugly. Liquid design was immediately popular with developers when they were given permission to just make stuff — i.e. when they weren’t constrained by overly rigid Photoshop layouts. Designers almost never used Liquid design because the layouts moved so quickly into ugliness and unusability — too wide to read, or too narrow, or with overlapping columns in early CSS layouts. Designers also disdained Liquid layouts because most of us see our job as imposing brilliant order on ugly chaos, and fixed proportions always seemed to be part of that order. Fig 1. The Web Standards Project: a liquid layout as seen on a wide computer screen. Designed by Andy Clarke in the early 2000s. Fig 2. The Web Standards Project: a liquid layout as seen on a narrow computer screen. On the narrow screen, type overlaps and the page becomes unusable. Ugly on one side. Unusable on the other. It took a special breed of designer to forge ahead with Liquid Layout anyway. Were it were not for the iPhone and the phones and tablets that rose quickly in its wake, the W3C would likely not have invented breakpoints. And without breakpoints, there could be no Responsive Web Design. And without Responsive Web Design, created by a visually gifted designer and with tools to satisfy his peers, the idea that drove Liquid design back in the 1990s would not, at long last, have caught on. It’s easy to view our current design thinking as more evolved than what we practiced in the past. And in some ways, it is. But if you read between the lines, it’s fair to say that our thinking was always advanced. It’s only now that our tools are beginning to catch up. ☞ Illustration by Justin Dauer. Follow me @zeldman. A version of this article appears on Medium. The 11th Annual Blue Beanie Day in support of web standards takes place November 30 on the internet. “When a person tells you that you hurt them, you don’t get to decide that you didn’t.”—Louis C.K. “USER CUSTOMIZATION” on the web hearkens back to the deluded old days of portals, when companies imagined you’d start your daily “net browsing” session by “logging on” to their website’s homepage. Customization was among the chief (largely imaginary) inducements for you to return to their “start” page and not others. The thought was that changing the fonts and color scheme would make their page feel more like your home. After all, Windows 3.1 users seemed to enjoy switching their home computers to “Black Leather Jacket” or other personalized settings—if only as an escape from the computer environment at work, where their bosses enforced a rigid conformist look and feel, and dictated which software and fonts were allowed on your workstation. Surely, the thinking went, pioneering web explorers would demand custom accommodations as plush as those found in the best-selling operating system. But, except on a few quirky personal sites like Jeremy Keith’s adactio.com, where sidebar customization widgets live on as a winking look back to the early days of personal content on the web, user customization for its own sake has long been out of favor—because experience, referrer logs, and testing have long shown that visitors don’t bother with it. Perhaps that’s because people don’t really visit websites any more. They drop in quickly on a page found by search or referred by social media, scan quickly and incompletely, and leave, mostly never to return. When you use Google, Bing, or Duck Duck Go to find out what a knocking sound in your radiator or a pang in your gulliver might mean, you scan for the information you sought, find it (if you’re lucky), and leave. The notion that most sites could get you to come back by offering you the ability to change fonts or colors is self-evidently absurd. Why bother? Ah, but there’s another kind of user customization that I’m hoping and betting will make a comeback: a subtle, inclusive sort of customization that doesn’t exist for its own sake, but rather to serve. Our glowing, high-density screens are great for watching Westworld, but a bit too bright and backlit for prolonged reading compared to the paper they’re intended to replace. But screens have one advantage over printed books (besides storage and portability): namely, they offer accessibility features a printed book never could. I once received an architecture book written by an important scholar, but I was never able to read it, because the layout was terrible: the type was too small, the leading too tight, and (most of all) the measure far too wide to be readable. If an ebook version had been available, I’d have purchased it; but this was before the mass market availability of ebooks, and the tome is now out of print. I own it, but I shall never be able to read it. It wouldn’t be a problem with an ebook, because all ebooks offer readers the ability to alter the contrast and the basic theme (white text on black, black text on white, dark text on a light background); all ebooks offer the ability to adjust font size; and most include the ability to change fonts. Why do Kindle and iBooks offer this flexibility? Because it helps readers who might otherwise not be able to read the text comfortably—or at all. This isn’t customization for its own sake. It’s customization for the sake of inclusion. Now notice who else provides some of this same inclusive customization function: the mighty New York Times. People in our industry tend to repeat things they’ve heard as if they are eternal verities—when the real truth is that each digital experience is different, each person who engages with it is different, and each device used to access each experience brings its own strengths and limitations. A font size widget may smell like the pointless old-fashioned “user customization” to be found on half the unvisited sites in the Wayback Machine, but it is the very opposite of such stuff. Even mighty responsive design benefits from offering a choice of font sizes—because there are just too many complications between too many screen sizes and device features and too many pairs of eyes to ensure that even the best designer can provide a readable experience for everyone without adding a simple text size widget. Most of the sites we’ve designed in the past few years have not had a text size widget, but I believe this was due to our privileged assumptions and biases, and not to the reality of the needs of those we serve. Going forward on client projects at studio.zeldman, and in my publications like A List Apart , I hope to correct this—and I hope you will think about it, too. Also published to A List Apart: Medium. AT FIRST GLANCE, November 2016 has bigger fish to fry than a small, cult holiday celebrated by web developers and designers. Each day since November 8, 2016 has brought new, and, to some of us, unimaginable challenges to the surface. Half of America is angry and terrified. The other half is angry and celebrating. At a time like now, of what possible use is an annual holiday celebrated mainly on social media by a tiny posse of standards- and accessibility-oriented web developers and designers? Many web developers have “moved on” from a progressive-enhancement-focused practice that designs web content and web experiences in such a way as to ensure that they are available to all people, regardless of personal ability or the browser or device they use. Indeed, with more and more new developers entering the profession each day, it’s safe to say that many have never even heard of progressive enhancement and accessible, standards-based design. Firstly, many new developers will build powerful portfolios by mastering tools whose functioning and implications they may not fully understand. Their work may be inaccessible to people and devices, and they may not know it—or know how to go under the hood and fix it. (It may also be slow and bloated, and they may not know how to fix that either.) The impressive portfolios of these builders of inaccessible sites will get them hired and promoted to positions of power, where they train other developers to use frameworks to build impressive but inaccessible sites. Only developers who understand and value accessibility, and can write their own code, will bother learning the equally exciting, equally edgy, equally new standards (like CSS Grid Layout) that enable us to design lean, accessible, forward-compatible, future-friendly web experiences. Fewer and fewer will do so. 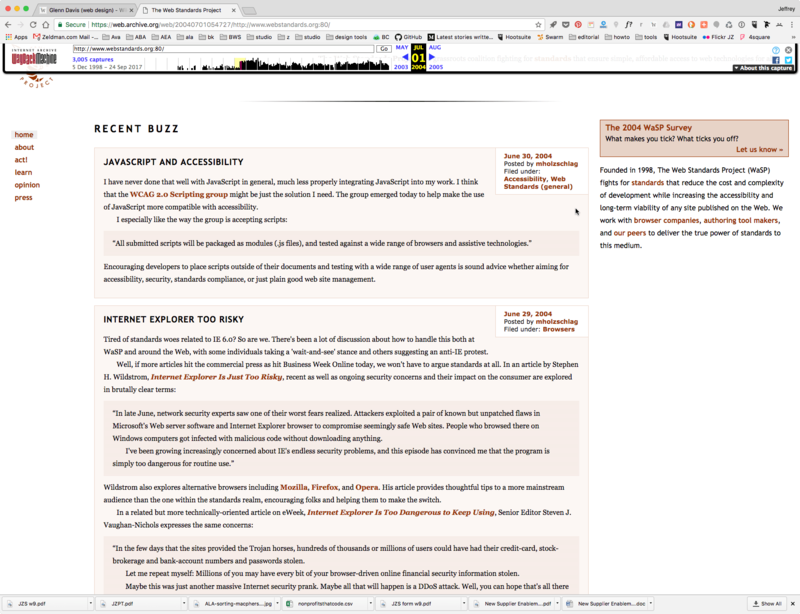 Thirdly, and as a result of the first and second points, more and more web experiences every day are being created that are simply not accessible to people with disabilities (or with the “wrong” phone or browser or device), and this will increase as standards-focused professionals retire or are phased out of the work force, superseded by frameworkistas. This third point is important because people with disabilities are already under attack, by example of the U.S. president-elect, and as part of of a recent rise in hate crimes perpetrated by a small but vocal fringe. This fringe group of haters has always been with us, but now they are out of the shadows. They are organized and motivated, and to an unmeasured degree, they helped Donald Trump win the White House. Now that he’s there, people of good will ardently hope that he will condemn the worst bigots among his supporters, and fulfill his executive duties on behalf of all the people. I’m not saying I expect him to do this today. I’m saying I hope he does—and meantime it behooves us to find ways to do more than just hope. Ways to make change. In doing those things, we can love our neighbors through action. That—and not simply making sure your HTML validates—is what designing with web standards was always about. On November 30, I will put on my blue hat and renew my commitment to that cause. Please join me. Title card from ‘Designing With Web Standards in 2016,’ An Event Apart presentation by Jeffrey Zeldman. Text is set in Forma, an upcoming face from Font Bureau. NOT UNLIKE what Mattel has done with Barbie, the typographic geniuses at The Font Bureau are working on a humanist geometric sans-serif that could almost be thought of as Helvetica with curves. Forma is the name of the as-yet unreleased font family, and you can get a peek at one weight of it in the above image, which is taken from my slide deck for “Designing With Web Standards in 2016,” which is the presentation I’ll premiere next month at An Event Apart Nashville. This new presentation examines the seemingly ever-deepening complexity of designing for our medium today—a complexity that has driven some longtime web designers I know to declare that web design has become “too hard,” or that “the fun has gone out of it”—and asks what our traditions of designing with web standards can teach us about crafting web experiences for a multi-device, mobile-first world. Given that my original (unpublished) title for Designing With Web Standards was going to be Forward Compatibility —and given that Forward Compatibility is not so different in concept from today’s phrase, Future-Friendly—I’m guessing that structured, semantically marked-up content, progressive enhancement, and the separation of style from structure and behavior still have a huge role to play in today’s day-to-day web design work. Oh, dear, I hope that wasn’t a spoiler.